PBS Press Tour, Los Angeles, CA, July 30, 2011 – The free concert offered by internationally acclaimed tenor Andrea Bocelli on Central Park's Great Lawn, Thursday, September 15, 2011, will be recorded in high definition by THIRTEEN’s GREAT PERFORMANCES. Accompanied by the New York Philharmonic, under the direction of music director Alan Gilbert, the Westminster Symphonic Choir, conducted by Joe Miller, with special guest artists to be announced, the gala event is a special gift to New York City. Andrea Bocelli Live in Central Park airs December 2 at 9 p.m. (check local listings) as part of the PBS Arts Fall Festival. Bocelli will present a varied repertoire that includes his best-known and best-loved songs, which have become fan favorites. He is widely regarded as the most popular Italian tenor in the world, with more than 70 million albums sold. In announcing the program’s selection as the final episode of the PBS Arts Fall Festival, PBS president and CEO Paula Kerger said, “We’re thrilled to have Andrea Bocelli as the finale of the first PBS Arts Fall Festival. The special is one of four distinguished presentations of GREAT PERFORMANCES for the Fall Festival, which will highlight nine extraordinary cities and regions of our country where the arts have taken center stage." All information for this special evening, including distribution of tickets that will be required for entry, will be available at www.bocellicentralpark.com. Since GREAT PERFORMANCES introduced American television audiences to Bocelli with 1997's Romanza concert, the tenor has been featured in an outstanding series of GREAT PERFORMANCES specials, including Sacred Arias, Amore, Vivere, My Christmas and American Dream, his spectacular "Statue of Liberty" concert from New Jersey's Liberty State Park. Sugar Music, the Milan-based label headed by chairman and CEO Filippo Sugar, that discovered Bocelli in 1994, was instrumental in bringing about the concert and has enjoyed a long and fruitful relationship with GREAT PERFORMANCES and THIRTEEN, producing nearly all of Bocelli’s specials. The PBS Arts Fall Festival is a multi-platform event anchored by nine broadcasts that highlight artists and performances from around the country, and online interactive exhibits that invite every American into the worlds of music, theater, dance, opera and cultural history. Andrea Bocelli Live in Central Park joins three other GREAT PERFORMANCES productions as part of the Festival: Miami City Ballet Dances Balanchine & Tharp, Il Postino from LA Opera and The Little Mermaid From San Francisco Ballet. A full list of Fall Festival programs is available at PBS Arts. "Bringing artists of this magnitude to audiences is core to our mission at THIRTEEN," said Neal Shapiro, WNET CEO and president, of the Bocelli event. "This free concert in New York City's ultimate performance space is another way we can make such historic events accessible to audiences who might otherwise find them out of reach." 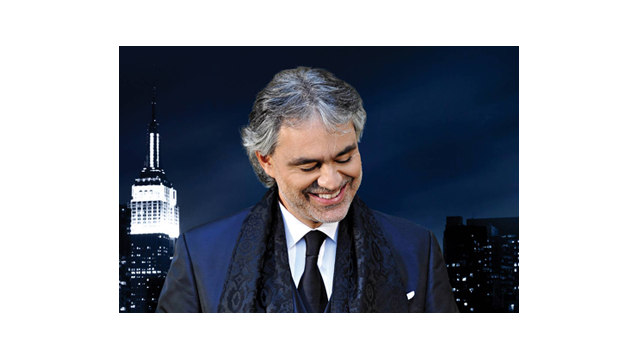 Andrea Bocelli has commented, "I cannot help but smile when thinking about the upcoming concert in Central Park. It was my father's dream, and my father was right, because my artistic path would have been entirely different without the strong and sincere embrace of this extraordinary city where everything is possible, even when it seems impossible. My father will not be there, but I can count on his blessing and his kind and gentle smile to give me courage. My mother, sitting in the front row, will feel my father, too, and they will be together again just like when I was a little boy performing on the fireplace steps. Perhaps they had secretly dreamed that I might have the opportunity to perform in New York City, and maybe right here in Central Park." Zarin Mehta, president and executive director of the New York Philharmonic, notes, "The New York Philharmonic and Andrea Bocelli have teamed up on more than one occasion in the past to joyful musical effect. This September will be our grandest collaboration to date. I can't think of a better way for summer in the city to culminate." New York City Parks Commissioner Adrian Benepe declared: "I join the Mayor and all New Yorkers in thanking Andrea Bocelli and all involved in making a beautiful autumn evening full of splendor and world-class music possible, in one of the most cherished outdoor places in New York City. From the Great Lawn in the heart of Manhattan to the GREAT PERFORMANCES series on WNET, where millions more will be able to share this gift, it will be a very special occasion. A million thank yous. Grazie mille!" Andrea Bocelli Live in Central Park will also be released on CD and DVD by Sugar/Decca this November. Andrea Bocelli Live in Central Park is directed by David Horn. For GREAT PERFORMANCES, Mitch Owgang is producer; Bill O’Donnell is series producer; David Horn is executive producer. Barilla is the main sponsor of the concert event and the television broadcast. Major funding for the GREAT PERFORMANCES telecast is provided by the Irene Diamond Fund, Vivian Milstein, the LuEsther T. Mertz Charitable Trust, the Starr Foundation, the Philip and Janice Levin Foundation, Joseph A. Wilson, public television viewers, and PBS. Photos and other material can be accessed at the THIRTEEN Online Pressroom: www.thirteen.org/pressroom/gperf. About Andrea Bocelli In 1994 Andrea Bocelli exploded onto the world stage with the hit song "Time to Say Goodbye," topping charts all across the world. In 1999, his nomination for Best New Artist at the Grammy Awards marked the first time a classical artist had been nominated in the category, since 1961. "The Prayer," his duet with Celine Dion for the animated film, "The Quest for Camelot," won the Golden Globe for Best Original Song and was nominated for an Academy Award in the same category. With the release of his classical album, "Sacred Arias," Bocelli captured a listing in the Guinness Book of World Records, as he simultaneously held the top three positions on the U.S. classical albums charts. Five of his albums have since reached the Top 10 on the Billboard 200, and record-setting seven, have topped the classical albums charts in the United States. In 2006, Bocelli was made a Grand Officer of the Order of Merit of the Italian Republic, and on March 2, 2010, he was honored with a star on the Hollywood Walk of Fame. He has been a guest at New York City's historic Carnegie Hall, and this past February, made his debut at the Metropolitan Opera House. He is widely regarded as the most popular Italian and classical singer in the world. A completely new hardcover translation of Bocelli's memoir, Andrea Bocelli: The Music of Silence, will be published by Amadeus Press in September. WNET is America’s flagship public media outlet, bringing quality arts, education and public affairs programming to over 5 million viewers each week. The parent company of public television stations THIRTEEN and WLIW21 and operator of NJTV, WNET produces such acclaimed PBS series as Great Performances, American Masters, Nature, Need to Know, Charlie Rose, Tavis Smiley and a range of documentaries, children’s programs, and local news and cultural offerings available on air and online. Pioneers in educational programming, WNET has created such groundbreaking series as Get the Math, Noah Comprende and Cyberchase and provides tools for educators that bring compelling content to life in the classroom and at home. WNET highlights the tri-state’s unique culture and diverse communities through SundayArts, Reel 13, NJ Today and the new online newsmagazine MetroFocus. As part of its commitment to increase every American’s access to and participation in the arts, PBS kicks off the multi-platform PBS Arts Fall Festival (PBS Arts) on October 14. Anchored by Friday night broadcasts, the Fall Festival features artists and performances from nine communities across the country, and celebrity hosts from each locale. With full-length performances, local mini-documentaries of arts scenes around the country, backstage access through interviews, artist and performer profiles, online immersive exhibits and classroom resources, the PBS Arts Fall Festival entertains and inspires consumers by offering a front-row seat to the creativity, culture, history and scope of the arts. Funding for the launch of PBS Arts Fall Festival has been provided by Anne Ray Charitable Trust, public television viewers and PBS. Founded in 1842, the New York Philharmonic is the oldest symphony orchestra in the United States and one of the oldest in the world. On May 5, 2010, it performed its 15,000th concert. Music director Alan Gilbert began his tenure in September 2009, succeeding a distinguished line of 20th-century musical giants that go back to Gustav Mahler and Arturo Toscanini. Renowned around the globe, the Philharmonic has appeared in 430 cities in 63 countries, including the historic visit to Pyongyang, DPRK in February 2008. The orchestra has made nearly 2,000 recordings since 1917, with more than 500 currently available. Credit Suisse is the exclusive sponsor of the New York Philharmonic. Composed of students at Westminster Choir College of Rider University, the Westminster Symphonic Choir has recorded and performed with major orchestras under virtually every internationally acclaimed conductor of the last 77 years. Recognized as one of the world’s leading choral ensembles, the choir has sung more than 350 performances with the New York Philharmonic alone. Recent seasons have included performances with Dresden Staatskapelle conducted by Daniel Harding, the Lucerne Festival Orchestra conducted by David Robertson, San Francisco Symphony conducted by Michael Tilson Thomas, Staatskapelle Berlin conducted by Pierre Boulez and the Bavarian Radio Symphony Orchestra conducted by Mariss Jansons. Westminster Choir College is a division of Rider University’s Westminster College of the Arts, which has campuses in Princeton and Lawrenceville, NJ. Sugar Music is the number-one independent music publisher and record producer in Italy and one of the most important in Europe. Run by Filippo Sugar, currently president of Italy's Federation of Music Publishers FEM, it is a family business following the steps of founder Ladislao Sugar since 1932. Over the years, the Sugar company has built up an impressive catalogue of modern classical works by distinguished composers such as Ennio Morricone, Luigi DallaPiccola, Luciano Berio, Goffredo Petrassi, Ivan Fedele, among others, while continuing to invest in the creation of popular music with more than ninety thousand copyrighted songs that often reach international fame, like Time to say Goodbye, Gloria, More. Through the recent acquisition of the CAM catalogue, home to Grammy and Academy Award winners Ennio Morricone, Riz Ortolani, Nino Rota, Luis Bacalov, Sugar is now a leading brand in movie soundtracks and film music internationally. Aside from music publishing, Sugar's renowned and effective talent scouting abilities, the founding pillars of Andrea Bocelli's world-wide success since 1993, have continued to flourish under deputy chairman Caterina Caselli Sugar. Several times a winner of Italy's Sanremo Festival with its songs and artists, Sugar's always-on approach to popular music as a venture that must appeal to international taste has managed to consistently promote the Italian tradition of popular and operatic melodies together with some of the most elegant fruits of contemporary popular music as represented by the growing European standing of artists such as Elisa, Negramaro, Malika Ayane, Raphael Gualazzi. For more information, please visit: www.sugarmusic.com.